Do you know anyone that is graduating this year? If you do, I have a pretty great gift idea for you to get them. I know when I left for college, it was so cool to get actual MAIL and lucky for me, my mom made it a point to drop a note in the mail for me weekly... but now you can step it up a notch! Send them a gift box subscription! Have you thought about a Loot Crate subscription? I am telling you, it is hard to imagine but they just keep being awesome. No disappointments here at all. We have been lucky enough to work with them in reviewing their boxes for a few months now and I have yet to get one that left me feeling like it wasn't totally worth the money like other subscription boxes seem to be. Have you ever eaten something and it was really good so you talk about it for a few days? 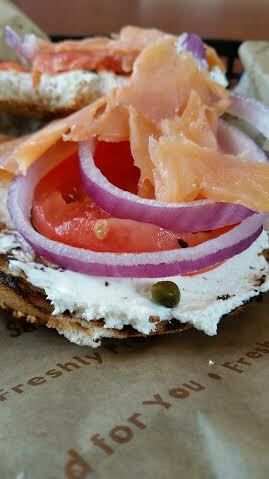 Some time back I was able to go and try a bagel from Einstein Bros Bagels and it was so good. So good that when I set up a meeting with a friend of mine, I suggested Einstein Bros Bagels again, just so I could get that same bagel. I was recently given the chance to work with Einstein Bros Bagels in a review of a limited time menu option, keep reading, I will tell you about it in a second... First, I want to show you a picture of THE bagel that keeps bringing me back. Do things slow down a bit for you once school lets out, or are things still crazy? I used to think that summer break meant BREAK for everyone, but I have quickly learned that is not the case. Yes school may be out, but it takes a good while for my son to get the sleep schedule changed. Honestly, I would prefer he keeps it, as it makes back to school a bit easier but hey... I remember loving to sleep in when I was younger. Just hope he gets to do it some, as his "sleeping in" has him waking up around 8 am. Anyways, with summer break, we seem to stay busy and I like it, as I don't have to hear "I'm bored" all the time. What are summer breaks like? You could have family come visit, you could be planning vacations, maybe you do plenty of summer camps? At the end of the day, the bottom line is this.. we stay busy and it is good to know that there are "ready to eat meals" like the ones from Go Picnic. Having a child in elementary school, we are always hearing about STEM. We even have STEM night at our school once a year! I do wish they would do it once every quarter or something, but hey... we can make the most out of it and enjoy it when it is offered and find ways to work on STEM activities through the year outside of school. 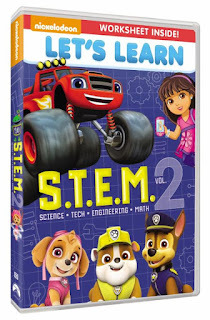 Science - Technology - Engineering - Math If you want a little help at home (without the kids realizing they are learning things) check out the latest DVD from Nickelodeon. It is from their LET'S LEARN line and we love them all. Not only do you get fun and educational programming, it is filled with the characters that our kids love!